Are you wanting so show off your awesome craft? and skills? 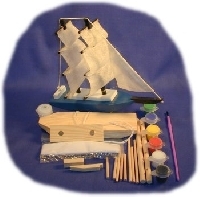 Send you partner a craft kit made by you or store brought that includes "everything" that you need to do this craft, eg. if it needs tape include the tape, glue, include it needles etc. its in there! With the exception of things like Punch Art, and Machine Sewing, you can pre punch and ink your punchies, you cant really send punches or sewing machines along. Check your partners Profile to see if they have access to a sewing Machine. Its up to you how much you spend, but consider something you would like to recieve, go for hearts !!! !